Who doesn’t like when secrets are given away? I know I do, and I can’t be the only one who thrives on search engine tips, rumors and gossip. This afternoon the expert panel of David Rodnitzky, Terry Whalen, Chris Knoch, Vinny Lingham and Chris Zaharias, we in the audience learned some new, exciting and potentially scary tips from these industry experts. Debunking 5 current SEM assumptions – the continued growth of the long tail, the 1,001 things to do in SEM, that everyone should do SEM, listening to the search engine and the opaqueness of search – the panel addressed the following realities of the SEM world. Chris Zaharias kicked us off by saying that the ever-popular long tail has reversed. In the second half of 2007 and through June of 2008, the popularity of 1 and 2 word phrases being searched upon has risen. Because of this, Chris says that search is now becoming a direct navigation portal. Searchers now go in and look up the names of websites they want to go to or the actual brand ad style of shoe they want to buy rather than performing multiple searches on different keyword phrases to ultimately find something worth buying. Long tail keywords can still work, but if you are setting yourself up as the final destination point of purchase, think of how you will reach that goal with the keywords you select. Next was Vinny Lingham, discussing that while there are thousands of SEM tactics to perform, do not do every thing for every one. The expensive and time-consuming campaign that worked wonders and gave a huge ROI for a B2C client may not have the same effect for a small B2B client. Vinny’s overall thought was to keep promotions tight and centered around gaining the larger ROE (return on effort) for your clients. Dave Rodnitzky came up and stated flat out that SEM may not be a good tactic for certain products, such as those with latent demand. He gave an example of TiVo. TiVo would not center itself around “alternative to VCR” because no one is searching for that term, even though that term descries exactly what it does. For these products, Dave recommends using alternatives to search engine marketing, such as placement targeting, vertical search, video advertisements or even (eek!) offline media. Chris Knoch was up next, warning us of the dangers of the search engine upsell. With helpful graphs as visual aids, Chris outlined that traffic from only organic search is found to be hugely relevant to company websites. Comparing that to search advertising traffic to company sites, the traffic is found to be hugely non-relevant. The search engines make money selling advertising tactics based on the great job they do of indexing and providing relevant sites for organic search. Before engaging in these search advertising platforms, make the search engine prove the quality of it within a targeted silo. Chris also reminds us that the biggest growth market for search engines is poor, non-converting traffic sources, so do your homework and be wary. Terry Whalen finished up the panel this afternoon by giving some information that is very simple, but that is hugely overlooked: The Internet is transparent. If you are a smaller company just starting out with SEO or PPC, there is a lot of competitive data out there that is relatively easy to find. Within a few minutes, a small business can look at competitor PPC ads and find out what keywords the competitors are buying, what their ad messaging strategy is and review their landing pages for relevance and messaging. This information is out there, and smaller businesses can use this information as a kickoff point for their campaigns. Terry said that a lot of companies don’t seem to be doing this competitive research, so he wanted to remind us of this tip to get us ahead of the norm. These 5 tips were informative and very engaging for the audience to hear. Whether they reminded us of something small we haven’t been doing in a while or alerted us to a new way of measuring, I know I left the session with ideas for improving even on these tips. I’m curious to see what next year’s session on SEM secrets will sound like, and what will have changed over the next 12 months. 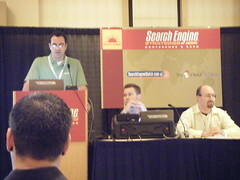 This concludes my posts from SES San Jose 2008. Keep following Ashley, Thomas and Jessica of the TopRank team on Wednesday for their session reviews and sessanjose08 pictures from tonight’s Google Dance! Im wondering if you could point me in the right direction in terms of running some competitor research? (Terry Whalen’s 5th point) Im really new to SEO and i am sort of lost in all the blogs, and internet articles. Are there programs you can use or websites that let you run checks on competitor keywords, campaigns etc? Terry Whalen was referring more to search advertising and PPC ads rather than search engine optimization, but I find the best way to look at competitor ads to to perform a search query for the keywords you want to be found for and look to see who is ranking both organically and paid for those words. these are some of your competitors. This is pretty simple basic stuff, but if you need anything more in depth, we can always help out.